You’ve heard about ‘glamping’ by now—which lets you combine the fun and adventure of camping with a touch of glamour and comfort. A canvas cabin with a real bed inside. A BATHROOM. And a floor. If its not exactly a bargain, it is one way to get a whole lotta luxury at the best price possible–especially if you go during the shoulder seasons of spring or fall. But at ranches like Montana’s Paws Up (shown above) and Ranch at Rock Creek, they’ve taken the concept to whole different level. It’s as if someone took good old comfort food and gave it a gourmet twist. Put another way—if Ralph Lauren camped out, this is where he’d stay. 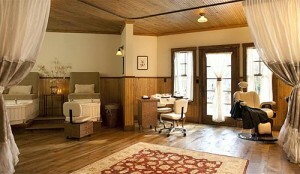 Navajo-style rugs on the floor, hand-crafted furniture, twice daily maid service. Yeah, you can bet the drovers on the Chisholm Trail never camped out like this! The minute you arrive at Montana’s The Ranch at Rock Creek, you’ve got some 50 miles of mountains, meadows, lakes and streams to help you shake off the bonds of civilization. That’s just for starters. Where you decide to lay your head at night is the rest of the story. If you’re looking for the perfect cross between comfort and a sense of being in the wilderness,The Ranch at Rock Creek offers three different options. For example, you might want to try their canvas-topped cabins, with luxury bedding and a private bathroom. Choose ‘Glamping for Two’ and you get one of Rock Creek’s four Classic Canvas Cabins (each a generous 630 square feet), which give you a spacious main room for your bedroom with enough living area to include a comfortable sitting area. Or consider the ‘Family Glamping’ option; each of the four Family Canvas Cabins (at 810 square feet) has two rooms separated by a curtain with space for a reading nook. And finally for two guests, there’s ‘Trapper’ for the most secluded glamping of all—‘the ultimate accommodation for those wanting to experience nature and luxury with maximum privacy’. Details: Open year-round with amenities that include a full spa. Some 15 miles from Philipsburg, Montana, and 1 hour 20 minutes from Missoula. 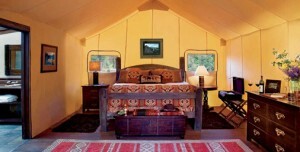 Glamping rates start at $950 per night and include ranch activities from archery to riding and fly fishing. All rates include full board with breakfast, lunch and dinner in the Granite Lodge and the Blue Canteen. Here, they call glamping ‘the original American Safari’, and that’s a pretty good description. Settle into one of 24 luxury tents featuring a rustic elegance that’s hard to find. Whether you’re looking for a romantic honeymoon destination or a way to ease the kids into camping (without having to listen to ANY whining), glamping at Paws Up is something else. Beyond the tent, which looks like it was furnished out of a designer catalogue, there’s electricity, a deck, first-class service, luxurious amenities, and world-class dining. And can you say Personal Camping Butler? Yep, he’s the guy that makes sure your every whim is satisfied (as far as legally possible). Details: Missoula International Airport is only 35 minutes away. Nightly rates start at $1555 (at the River Camp) and include meals and a mind-boggling list of activities, including guided activites, fun stuff for kids, winter sports, and wilderness workshops. 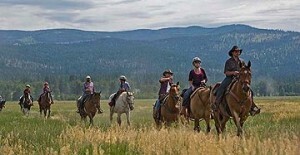 For more detail and photos, check out both ranches on Ranchweb.com. Kelly Williams of Colorado writes to tell us about a great accomplishment that the Lodge and Spa at Brush Creek Ranch (a member of RanchWeb) recently announced. Brush Creek Ranch recently received the highly sought after designation as an Orvis-Endorsed Fly Fishing Lodge. “I’m sure you are familiar with this prestigious recognition that only 50 lodges in the US have received,” writes Kelly. We sure are! 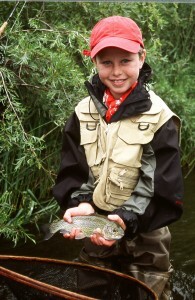 The Orvis Standard represents the hallmark of excellence in the fly fishing world and is based on strict criteria that evaluates “the level of overall hospitality at the lodge, the education provided by the fishing guides, emphasis on conservation within the organization, the quality of the fishery recognized and the overall guest experience”. Brush Creek Ranch now sits among the pantheon of sporting lodges in the world which have received this honor. As Kelly says, “An alternate to the traditional dude ranch, this 13,000-acre luxury guest ranch touts its unparalleled fly fishing program as one of the cornerstones of the resort.” Hard by the million-acre Medicine Bow National Forest, The Lodge & Spa at Brush Creek Ranch offers a diversity of angling venues with both wading and float fishing options for wild rainbow, brown, brook and cut throat trout, including ten miles of exclusive access via Brush Creek, North Brush Creek, and the Encampment and North Platte, both internationally-recognized freestone rivers. 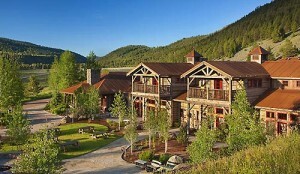 We tip our hats (and our creels) to The Lodge & Spa at Brush Creek Ranch! Details: The Lodge & Spa at Brush Creek Ranch is set outside of Saratoga in South Central Wyoming’s North Platte River Valley. This is the time to book a spring fishing trip. For more information or to inquire about rates call (307) 327-5284, or visit them at Ranchweb.